With a starting price of $24,995 MSRP, The 2018 GMC Terrain comes across as an accessibly-priced small crossover with seating for five. The problem, up until now, is that recent model years have reaffirmed what anyone with an ear to the segment already knew: the Terrain was showing clear signs of age (with a hint of generational disconnect). That said, ripping the cover off of the 2018 Terrain unveils some nice surprises. First of all, it enjoys a reduction of both weight and length. This speaks to the evolving expectations of commuters, urban dwellers and younger drivers alike. Proving beneficial in terms of output, fuel economy and overall footprint, the most impressive feat is that the reduction does little to diminish the cabin experience. Head and legroom remain largely unchanged, as does available cargo space. This, combined with upgraded engine selections start to tell the story of what makes the 2018 GMC Terrain worth considering. With that in mind, let’s look at five reasons why you shouldn’t overlook it. In the land of corporate stablemates, the Terrain is the fraternal twin of the overwhelmingly popular Chevy Equinox. Boasting many of the same attributes, the two are different enough that it’s easy to remember which is which. This a strength for anyone, who might otherwise overlook the GMC lineup for the immediately relatable Chevy offerings. As mentioned above, the Terrain provides ample space ensuring both passenger comfort and utilitarian suitability for transporting various cargo. While a comfortable interior should be a base expectation of any vehicle, GMC’ success in offering it despite reduced exterior dimensions is worth applauding. GM offerings are widely celebrated for the inclusion of available technology, and the GMC infotainment system is warmly received. Bluetooth-enabled, and compatible with Apple CarPlay and Android Auto, the Terrain has countless other options worth exploring across trim levels. These include, but are not limited to, camera systems, driver assist features, and a comprehensive safety package. The intention of using a small crossover for towing (with any expectation of performance) is less-than-well-thought-out, at best. That said the Terrain offers a 3500 max towing capacity, when equipped with a 2.0-liter engine, allowing it tow conservatively with confidence. The inclusion of comparable and easily accessible cargo space helps to enhance its sense of utility. With six trim levels served up, the Terrain offers ‘room-to-grow’ in terms of upgrading its built-in features and attributes. With the line-topping Premium trim priced to start at $31,595, there are any number of options to choose from. That said, add-ons are plentiful, and it’s easy to exceed the $40G mark for those who want it all. That said, with ‘the good’ comes criticisms regardless of trim level. 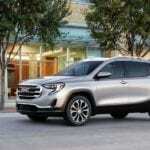 For a more in-depth look at a loaded 2018 GMC Terrain, here’s a test-drive courtesy of CarGurus YouTube channel, that explores some of those criticisms, empowering you to make the best possible choice.